Giraffes are complex animals that possess many impressive features. Behind their beautiful appearance with a unique fur, long neck, and unparallel tallness, some peculiarities define them as unique animals in the world. 1. The giraffe is the tallest animal in the world with an average height of 16 to 20 feet. 2. Giraffes can reach a speed running up to 60 km/h. 3. Humans and giraffes have the same number of vertebrae in their necks; the difference is that those from the giraffe are enormous. 4. Giraffes are herbivores but can lick carcass bones to absorb calcium. 5. The favorite food of giraffes are the leaves of the genus Acacia, a thorny tree. 6. The tongue of all species of giraffes is prehensile, black and can measure up to 20 inches. 7. Giraffes are not mute; they perform several vocalizations that resemble those of a cow. 8. Mothers give birth standing, and the baby falls to the ground at the height of about two meters without suffering damage. 9. The kicks are their biggest defense. They are capable of killing a lion with just one of them. 10. The speed, size, and excellent vision of giraffes also help them to flee from predators successfully. 11. Giraffes are the largest ruminants in the world. They have four compartments in their stomach capable of digesting all the leaves they consume. 12. Males are usually more solitary, although the herds may have a set of females and males as well as young. 13. Giraffes are genetically related to the okapi, with whom it shares some similarities. 14. There are four species of giraffes, with some endangered subspecies. 15. Both genders have protuberances of ossified cartilage covered with skin on the top of their head called ossicones fused to the skull. 16. Giraffes have been present on the African continent for about 10,000 years. 17. Each subspecies has a unique pattern of spots that become darker with age, especially in males. 18. Giraffe’s diet is entirely herbivorous, and they feed on more than 100 types of leaves. 19. Females live 25% more than males; this is because they wear out more. 20. The future of all giraffe species depends on the quality of the habitat left to them. Every day their populations are reduced more by an environment insufficient for their survival. 21. Poaching and farming are the two primary threats that these magnificent mammals face. 22. Giraffe closest relative is the Okapi. 23. Both genders have ossicones. While some people assume that only the males do, all have them. However, those of females are shorter and grow hair on the top. 24. Giraffes have seven vertebrae in their necks which give them the flexibility of a wide range of movement with it. 25. Giraffes are extremely fast. Their front legs are about 10% longer than their back legs. However, they can only run for a short period which sometimes makes difficult for them to outrun predators. 26. The heart of the giraffe weighs about 25 pounds and reach up to 2 feet long. 27. It is common to see giraffes interacting with other animals in the wild including zebras. Experts believe this is because the giraffes can see for a long way, and due to their height in areas where those other animals can’t. This characteristic helps them to get an early warning of potential predators in the area. 28. Female giraffes give birth standing up, and their young may drop several feet to the ground as they are being born. They are protected by the sac though, and this keeps them from being harmed during that process. A newborn is about 6 feet tall! 29. The spots on the bodies of giraffes offer them some protection in the wild. The camouflage from it blends in well with the African background. Those spots can also be confusing to predators. 30. A giraffe will consume around 75 pounds of food each day in the form of leaves, grass, and twigs. 31. The tongue of a giraffe is about 18-20 inches in length. Also, they can bend it to grasp items and to hang onto them. 32. Giraffes only need about 4.6 hours of sleep each day. Some of them sleep at intervals of no more than 5-20 minutes at a time. 33. 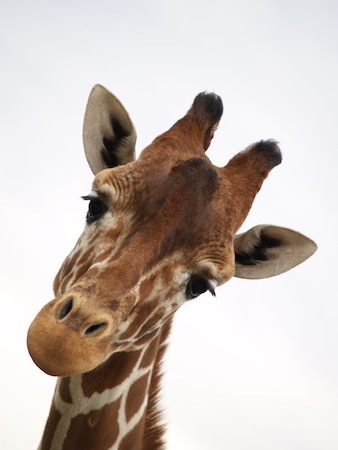 Giraffes do make some types of vocalization which most people have never heard. They include meows by calves and hissing by adults. 34. It may surprise you to learn that humans often hunt giraffes for their tails, their hides, and to consume their meat. 35. Giraffes can go for some days without drinking water which is a huge advantage over other animals. There is usually enough water in the leaves of the food they consume to take care of that need for them, but during the dry season, they can drink 10 gallons of water a day.